(Remember, if you need help finding any of the below mentioned Phnom Penh locations, most can be found on this map art_map_alt, kindly provided to the Kumnooh website by arts+society). A big week in books and photographs in Phnom Penh, and with photography continuing in Siem Reap. Opening on Friday 29 and continuing through to Sunday 1 at the National Library of Cambodia (St 92, near Wat Phnom and opposite the US Embassy), is the Cambodia Book Fair, a collaboration between Cambodian Librarians and Documentalists Association, Sipar, Room to Read, SVA, IBBY, Hun Sen Library of Royal University of Phnom Penh, Library of Pannasastra University of Cambodia, and the French Institute. The theme of the fair is Cambodia and Book Publishing, and the three day programme includes a range of activities surrounding books and writing, including workshops, lectures and discussions. Check the links for more detailed information. On the afternoon of Saturday 30, the PhotoPhnomPenh festival opens with a speech at the French Institute (St 184 between 63 and Monivong), after which, from 2 pm, you can ride around the city to visit all the indoor exhibitions in official festival tuk tuks. Then on Sunday 1, a round table discussion on photography books will be held in conjunction with the Cambodia Book Fair, with a second tuk tuk tour, this time taking in all the outdoor exhibitions. At 6 pm on Sunday 1 there will be a photo screening near the site of the former Phnom Penh Catholic church, featuring five years of Studio Images, the French Institute’s photography workshop. On the evening of Monday 2, you can attend the opening of several RUPP exhibitions, followed by a photo screening and and live music with the Phare Ponleu Selpak band, Van Than, from 6.30 pm. The festival’s opening week continues until December 4, while most individual exhibitions remain open until the end of the month. Get all the information you need from the link below. As part of PhotoPhnomPenh, on Saturday 30 there is a special late night opening for Romeet Gallery’s festival exhibition: The Pink Choice by photographer Maika Elan, which explores daily life of gay couples in Vietnam. The opening is in partnership with Blue Chilli Bar, St 178 near 19. Starts at 6 pm, gallery open until 11 pm! Meanwhile in Siem Reap, the ninth annual Angkor Photo Festival continues its programme until Saturday 30. On Sunday 1 Drink and Draw Cambodia holds its final event for the year, at Baitong Restaurant (St 360, between St 51 and Norodom) as usual from 5 pm to 7 pm. Includes a live model, snacks and drinks. Register now! Our City Festival continues its efforts to raise $8000 to support artist projects for the event early in the new year. Please give generously to assist in making this festival fly. In Siem Reap, the ninth annual Angkor Photo Festival continues its programme until Saturday 30. Friday 29 to Sunday 1, Cambodia Book Fair at the National Library of Cambodia (St 92, near Wat Phnom and opposite the US Embassy). Includes a range of activities surrounding books and writing, including workshops, lectures and discussions. Saturday 30 to Wednesday 4, opening week for the PhotoPhnomPenh festival at locations around the city. Official opening on Saturday afternoon at French Institute of Cambodia followed by tuk tuk tour of exhibitions around town. Get all the information you need from the link below. Saturday 30 a special late night opening for Romeet Gallery’s PhotoPhnomPenh festival exhibition: The Pink Choice by photographer Maika Elan, in partnership with Blue Chilli Bar, St 178 near 19. 6 pm to 11 pm. Peace Café (#14, St 392 (in front of BKK High School), hosts a fundraising photo exhibition for the benefit of disaster relief in the Philippines. Until November 28. Before and Today, by illustrator and cartoonist Prum Vannak, at the tiny Rik Reay Gallery (and noodle shop), on St 178 near St 19. Until 14 December. Once, a mixed media exhibition by Bernadette Vincent, at Feel Good Café (#79, Street 136, btw Sts 15 and 13). Until December 5. Caribbean Souls, Fantasy and Mythology, paintings by Dominican artist Marcos Guerra at Chinese House (Sisowath Quay & St 84). New Leaf Book Cafe in Siem Reap, exhibition for Small Art School for the whole of November & December, featuring the work of young aspiring Cambodian artists. Wednesday 20 from 5.30 pm to 6.30 pm, Peace Café (#14, St 392 (in front of BKK High School) is hosting a fundraising photo exhibition for the benefit of disaster relief in the Philippines. The photographs were taken on Samar Island, the first to be hit by the typhoon, and the home of the photographer. The exhibition will run until November 28. The latest exhibition at the tiny Rik Reay Gallery (and noodle shop), on St 178 near St 19, opens on Wednesday 20. 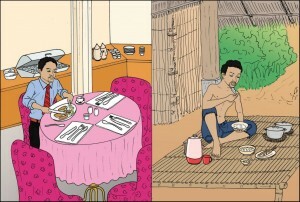 Before and Today, by illustrator and cartoonist Prum Vannak, explores the two worlds the artist lives in – contrasting domestic life in rural Pursat with the international acclaim and awards relating to his work exploring his experience surviving labour trafficking. Phnom Penh Community College continues a series of two-hour Wednesday evening workshops hosted by artist Chhan Dina. This week, 3D acrylic painting; register now for still life oil painting next week. Follow the link for bookings and further details. On Friday 22, there is a little theatre at Java Café and Gallery downstairs: Performance Exchange Theatre Company from London present Shakespeare for Dummies and Elephant Man. Tickets $10, from the venue. Limited seats. The big news this week is in Siem Reap, where the ninth annual Angkor Photo Festival opens on Saturday 23. The week-long event includes work from 130 photographers from around the world. Check the website for the enormous programme. As part of the Angkor Photo Festival, McDermott Gallery Old Market hosts two simultaneous exhibitions from November 21 until December 13: MUTE: The Silence of Dogs in Cars by British photographer Martin Usborne and Hatachi No Shokei by Japanese photographer Herbie Yamaguchi. The opening reception will be held on Sunday 24 from 6 pm. Also in Siem Reap, New Leaf Book Cafe is running an exhibition for Small Art School for the whole of November & December, featuring the work of young aspiring Cambodian artists. Meanwhile, in Battambang, Sammaki Gallery (#87, St 2.5) is hosting Family, a selection of artworks by graduating students from Phare Ponleu Selpak Visual Arts School. The exhibition runs until February 17. On Sunday 24, this week’s public tour by Khmer Architecture Tours covers the often overlooked area of Front du Bassac and Chaktomuk Theatre in Phnom Penh. A two hour walking tour. Reservations required, email contact@ka-tours.org. Phnom Penh’s Our City Festival has until December 6th, 2013 to raise $8000 to support the artist projects. Please give generously to assist in making this festival fly. Register now for Drink and Draw Cambodia’s last session for 2013, on Sunday December 1, at Baitong Restaurant (St 360, between Norodom and 51). Wednesday 20 from 5.30 pm to 6.30 pm, Peace Café (#14, St 392 (in front of BKK High School), a fundraising photo exhibition for the benefit of disaster relief in the Philippines. Until November 28. Wednesday 20, Before and Today, by illustrator and cartoonist Prum Vannak, at the tiny Rik Reay Gallery (and noodle shop), on St 178 near St 19. Until 14 December. Phnom Penh Community College continues a series of two-hour Wednesday evening workshops hosted by artist Chhan Dina with 3D acrylic painting; register now for still life oil painting next week. Follow the link for bookings and further details. Friday 22, at Java Café and Gallery downstairs: Performance Exchange Theatre Company from London present Shakespeare for Dummies and Elephant Man. Tickets $10, from the venue. Limited seats. Saturday 23, the ninth annual Angkor Photo Festival opens in Siem Reap, featuring 130 photographers from around the world. Check the website for the enormous programme. Sunday 24 from 6 pm, at McDermott Gallery Old Market, Siem Reap, opening reception for two simultaneous exhibitions as part of the Angkor Photo Festival. MUTE: The Silence of Dogs in Cars by Martin Usborne and Hatachi No Shokei by Herbie Yamaguchi. 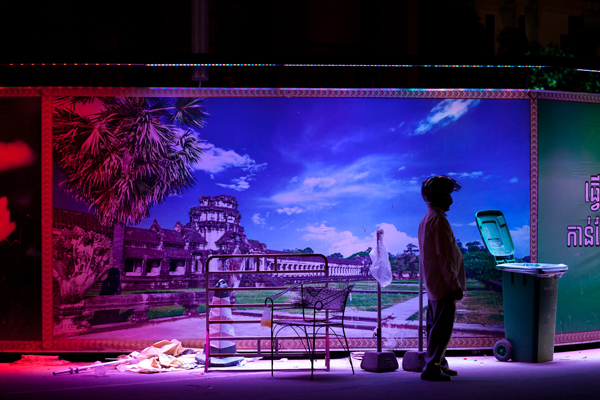 Sunday 24 from 8.30 am, Khmer Architecture Tours features Front du Bassac and Chaktomuk Theatre. Reservations required, email contact@ka-tours.org. Distant Geography: words, collages and poetry by Chath pierSath, at Java Café and Gallery (56 Sihanouk Blvd ). Until November 24. Phnom Penh crams everything into a few days ahead of Water Festival; most arts spaces will be closed over the weekend. On Tuesday 12 and Wednesday 13 at 7 pm, Feel Good Café (#79, Street 136, btw Sts 15 and 13) hosts Once, a multi-disciplinary performance that combines painting, dance, installation and poetry: four performers in a transformed stairwell. Seating is limited to 25 people, tonight is almost full but good seats still available for Wednesday. Tickets $8, from the venue only. The accompanying exhibition opens Thursday 14 at 7pm. At Java Café and Gallery on Tuesday 12, as part of his ongoing exhibition Distant Geographies, diaspora artist and poet Chath pierSath will talk and read from his works, with Q&A. The exhibition runs until November 24. More poetry at Java Café and Gallery on Wednesday 13, with the monthly Open Stage: Poetry evening from 7.30 pm. This month the curator is Seattle scene poet Greg Bem, who will feature members of Nou Hach Khmer writing group. Guest readers also welcomed, in all languages. Also on Wednesday 13, Phnom Penh Community College evening art workshops with Chhan Dina continue, this week with collage. To continue the poetry theme, Bye-bye Bywater@Baitong on Thursday 14 marks the conclusion of a 6 month residency by poet and songwriter Scott Bywater at Baitong Restaurant on St 360 (btw Norodom and St 51). Readings are promised along with the music, plus guests. If you’ve not been getting enough hip hop dance in your life, there’s a treat during this quiet weekend on Saturday 16 with the Rom Bak Battle at Slur Bar (St 172 btw Norodom and St 51), a dance competition that aims to bring together local and international breakdancers. From 9 pm til late. Also on this weekend, the Khmer Architecture Tours event on Sunday 17 features Olympic Stadium. Reservations required, email contact@ka-tours.org. Just one last thing: fans of the WASH poetry/music collaboration will be pleased to know that their first album, Triptych, all made-in-Phnom Penh, is now available for download on a pay-what-you-want basis at the music distribution website Bandcamp. Yes, that means it’s free if you like, or you can choose your amount of payment. For $10, an accompanying limited edition full colour 18 page booklet, featuring paintings by Chhan Dina and Adrianna Snochowska, can be hand delivered to you in Phnom Penh (or posted to the gift recipient of your choice with the addition of a shipping charge). And you can sign up to the WASH mailing list here:http://bit.ly/washnews. And keep your eyes open for the upcoming festival season in Cambodia: over the next two months we will have the opportunity to view the Angkor Photo Festival, Cambodian International Film Festival, Phnom Penh Photo and the Our City Festival. Tuesday 12 and Wednesday 13 at 7 pm, multi-disciplinary performance Once at Feel Good Café (#79, Street 136, btw Sts 15 and 13) Tickets $8, from the venue only. The accompanying exhibition opens Thursday 14 at 7pm. Tuesday 12 at Java Café and Gallery, artist and poet Chath pierSath will talk and read from his works, with Q&A. His Distant Geographies exhibition runs until November 24. Wednesday 13 at Java Café and Gallery, Open Stage: Poetry evening from 7.30 pm. Curated by Seattle scene poet Greg Bem, and featuring members of Nou Hach Khmer writing group. Guest readers also welcomed, in all languages. Wednesday 13, Phnom Penh Community College evening art workshops with Chhan Dina continue, this week with collage. Thursday 14 from 7.30 pm, Bye-bye Bywater@Baitong at Baitong Restaurant on St 360 (btw Norodom and St 51), the conclusion of a 6 month residency by poet and songwriter Scott Bywater . Readings are promised along with the music, plus guests. Saturday 16 from 9 pm, hip hop dancing competition, the Rom Bak Battle at Slur Bar (St 172 btw Norodom and St 51), local and international breakdancers. Sunday 17 from 8.30 am, Khmer Architecture Tours features Olympic Stadium. Reservations required, email contact@ka-tours.org. Distant Geography: words, collages and poetry by Chath pierSath, at Java Café and Gallery (56 Sihanouk Blvd ). The show runs until 24 November, and a reading and Q&A with the artist will be held on Tuesday 12 November. Phnom Penh Community College is commencing a series of two-hour Wednesday evening workshops hosted by artist Chhan Dina. Over the next four weeks challenge yourself in mosaic, collage, 3D acrylic painting and still life oil painting. Follow the link for bookings and further details. On Wednesday 6 at 6.30 pm Meta House hosts a Do-It-Yourself artist talk by renowned MIT professor Ute Meta-Bauer, a curator of exhibitions on contemporary art, film, video and sound for more than 25 years. The talk will examine a number of major 20th century avant-garde exhibitions and their impact in shifting artistic paradigms. Thursday: stand back, this is going to be rough; it’s a big night. The 10th International Music Festival Phnom Penh opens on Thursday 7 at 6 pm with a pre-concert introduction, followed by the first concert at 7 pm, at the InterContinental Phnom Penh. The theme this year is European art music development in the 20th century, and concerts from Thursday through to the grand finale explore the shifts and changes in musical styles and influences with an emphasis on the first 50 years from the fin de siecle to the end of the Second World War. There is also an increased involvement of Cambodian performers and composers, reflecting the efforts of the festival to increase accessibility to art music for Cambodians. Check out the staggering programme that runs through to Monday. Free entrance, but get your tickets in advance. Meanwhile, also at the InterContinental Phnom Penh on Thursday, a new exhibition at the Insider Gallery, Flowers Power by French-Canadian painter Stéphane Delaprée opens at 6:00 pm. The exhibition runs until November 30th. Across town on Thursday, from 6 pm – 8 pm, Sa Sa Bassac hosts the opening of Urban Street Night Club, a single-channel video and photographic series by Lim Sokchanlina that challenges the latest urban corrugated fencing trends, transforming banal barricades into scripted urban spaces, following on from his first series, Wrapped Future. Lim Sokchanlina, Untitled, Urban Street Night Club, 2013. Digital C-print, 80x120cm. Finally on Thursday, at 7.30 pm, you can get a little literary and pop along to the launch of Scott Bywater’s new volume of poetry, presence, at Baitong Restaurant (#7, St 360, between Norodom and St 51). There will be readings and guests and he might even play Phnom Penh Driving School for you. On Friday 8 from 8 pm, Meta House presents Kingdom Behind the Scenes, a photographic exhibition by Phnom Penh resident Alex Wyrick, in which people on the streets in Cambodia are shot in their natural environments in the style of corporate headshots. On Saturday 9 (Cambodian Independence Day) from 6 pm, at Java Café downstairs, the book launch of Unity, a book of photography by Kim Hak that focuses on the mourning of the death last year of King Father Norodom Sihanouk. The evening will feature a talk and Q&A, and Unity will be on sale at a special price for the evening. And on Sunday 10 from 8.30 am you can take part in the next public architecture tour of central Phnom Penh by cyclo, hosted by Khmer Architecture Tours. Reservations required, email contact@ka-tours.org. Phnom Penh Community College is commencing a series of two-hour Wednesday evening workshops hosted by artist Chhan Dina. Follow the link for bookings and further details. Wednesday 6 at 6.30 pm Meta House hosts a Do-It-Yourself artist talk by renowned MIT professor Ute Meta-Bauer, a curator of exhibitions on contemporary art, film, video and sound for more than 25 years. Thursday 7 through to Monday 11, the 10th International Music Festival Phnom Penh at the InterContinental Phnom Penh and Meta House. Free entrance, but get your tickets in advance. Thursday 7 at 6 pm, opening of Flowers Power by French-Canadian painter Stéphane Delaprée at the Insider Gallery, InterContinental Phnom Penh. Until November 30th. Thursday 7, from 6 pm – 8 pm, the opening of Urban Street Night Club, by Lim Sokchanlina at Sa Sa Bassac. Thursday 7, at 7.30 pm, the launch of Scott Bywater’s new volume of poetry, presence, at Baitong Restaurant (#7, St 360, between Norodom and St 51). Friday 8 from 8 pm, Meta House presents Kingdom Behind the Scenes, a photographic exhibition by Phnom Penh resident Alex Wyrick. Saturday 9 (Cambodian Independence Day) from 6 pm, at Java Café downstairs, the book launch of Unity, a book of photography by Kim Hak that focuses on the mourning of the death last year of King Father Norodom Sihanouk. Sunday 10 from 8.30 am you can take part in the next public architecture tour of central Phnom Penh by cyclo, hosted by Khmer Architecture Tours. Reservations required, email contact@ka-tours.org. A retrospective exhibition by Cambodian textile artist Marine Ky, Toile et Végétal, at the Exhibition hall of the Institut français du Cambodge.